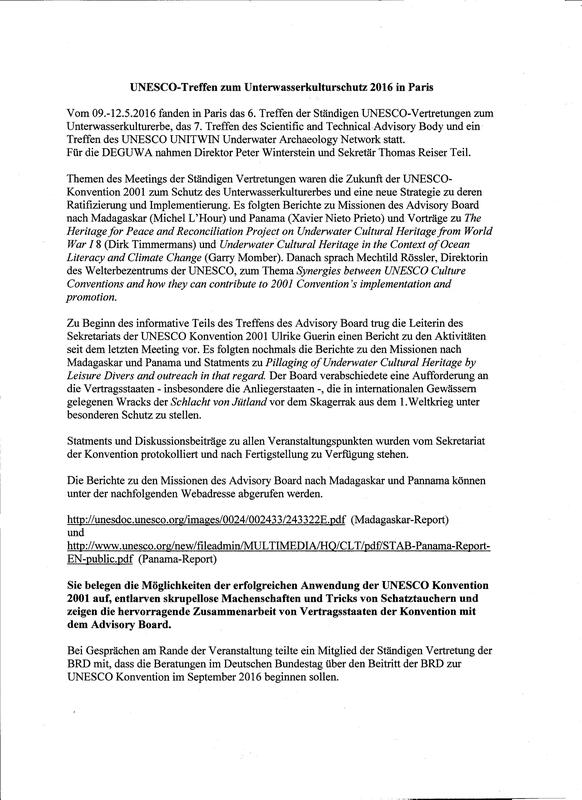 The Advisory Body advises the General Assembly of States Parties to the UNESCO-Convention in questions of a scientific or technical nature regarding the implementation of the "Rules concerning activities directed at underwater cultural heritage" (Annex of the Convention). It can be consulted for drafting operational guidelines compliant with the Rules and advises on practical questions of international cooperation, which are part of the Rules of the Convention (Art. 8-13). The members of the Advisory Body have currently appointed fifteen accredited NGOs for advice and cooperation. The Advisory Body reports on their activities on occasion of the Assemblies of State Parties to the Convention. Here you will find the official reports. Report by H.G. Martin on occasion of the second Assembly of State Parties to the Convention 2009 in Paris.